For most of the last 15 years I have worked in organisations that recruit a lot of graduates. In the middle of the last decade, everyone suddenly started talking about Generation Y and generational differences. We all sat through presentations (I even did a few myself for management teams) where people talked about the differences between Baby Boomers, Generation X and Gen Y. We predicted doom and gloom as these extra-terrestrials took over our workforce and the current working demographic rapidly aged. Rest assured I’m not going to re-hash the clichés here. Those of you with long memories might remember a brash young Aussie guy called Peter Sheahan. Sheahan was young enough to call himself Gen Y and no doubt made a lot of money while travelling around Australasia and beyond doing very entertaining presentations on generational differences and peddling all the generational clichés we now all love to hate. He happily fuelled the stereotypes. 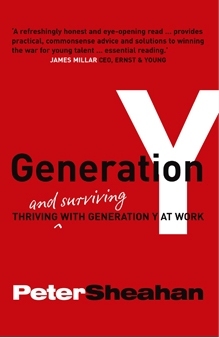 We hailed him as a genius and his book on Generation Y became something of a bible for panicking Australasian HR Managers. It’s interesting now that whenever anyone writes an article or blog post on “how to get the best out of Gen Y” we all erupt into apoplexy and condemn them for regurgitating the same old nonsense. How times have changed! Seven years ago I wrote an article for my then company alumni magazine in which I described Gen Y as impatient, manipulative and demanding. However, I also said they could be passionate, creative and innovative. It is interesting to read it now with the benefit of hindsight. I talked about Gen Y being more loyal to their careers than to organisations, their emphasis on self-development, constantly needing to learn new skills and meet new challenges. I said it was a waste of time trying to retain them because they would always be on the lookout for something better. All they were doing with you was building another part of their CV. I said that Gen Y wouldn’t tolerate bad managers for long, and were looking for good management aligned with outstanding leadership. I concluded by saying that Gen Y would make the rest of us become better managers, that we would need to create environments where people want to be, being a role model, mentor and coach, recognising and rewarding positive behaviours, delegating more effectively, providing more feedback, spending more time on coaching. So what happened? Well the world didn’t end, although the GFC and resulting recession threw us a bit of a curve ball. Perhaps that levelled the playing field, but there wasn’t a huge confrontation between the generations. When you read those words I wrote now, what they describe is what we ALL aspire to in the modern workplace. What actually happened was what always happens. The younger generation entered the workforce full of confidence, arrogance and ideas, the older generation learned some new skills and everyone co-existed quite happily. Those so called “traits” of Gen Y became the norm, became mainstream. Most of the managers I work with nowadays are Gen Y. They are not really any different from managers 10 years ago, the Gen X or Baby Boomer managers. There are some really good ones, some not so good ones, and like everyone else they struggle to balance leading their teams with getting the work done. So why is there still this fascination with Gen Y as a generational concept? Ultimately it was all nonsense and has had no bigger impact on the workforce than say those of the generation who were speeding out to the Who or pogoing away to the Jam all those years ago. Every generation has an impact and makes a difference in the workforce. But they also adapt to how things are more traditionally done. Oh, and what happened to Peter Sheahan? He is now apparently an entrepreneur and CEO with operations in 9 cities and 3 countries, author of six books and one of the 25 most influential speakers in America. He has a client list to die for judging by his website. AND I bet he only works 3 days a week and takes months off at a time to go surfing – because he can. Still walking the talk and living that mythical Gen Y dream! You’ve got to admire that.